How to generate first N triangular numbers in Java? 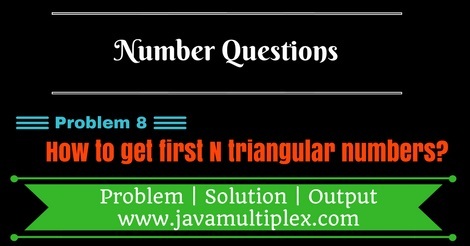 Home Basic Number Questions Formula Based Questions How to generate first N triangular numbers in Java? Write a program in Java that generates first N triangular numbers. We can generate Nth triangular number or triangle number using below formula. For example - first 6 triangular numbers are 1, 3, 6, 10, 15, 21. * @problem How to generate first N triangular numbers? Output - How to generate first n triangular numbers in Java? Tags : Triangular numbers in Java, Solution in Java, Mathematics problems, for loop, if else statement, Sum of first n natural numbers.